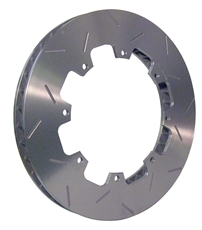 These brake rotors fit all wide-5 hubs and brake hats with 8 bolt 7" bolt circles. They feature 40 directional vanes for superior cooling and are ideal for heavy duty braking applications such as on the front of asphalt late model or dirt cars. They are available with cross hatch gas vents to keep the pads from glazing and provide optimum braking.